Litvinenko – What Really Happened? As we all know Alexander Litvinenko was poisoned by polonium, a rare radioactive substance. The main narrative blamed it all on Vladimir Putin of Russia. The rationale rested on little other than because Litvinenko was a Putin critic. This was the quick line in mass media, and it was on all the typical war propaganda channels. There are many things wrong with the “Putin did it” story. For one, there is no motive, even with Litvinenko being a critic of Russia, he was no threat whatsoever to Putin. The man worked with Chechen terrorists and the Israeli-Russian oligarchs. But assuming that there was a sufficient motive to kill him, think about this: Why would Russia use a very rare, very expensive, and easily traceable radioactive substance to kill him instead of some cheap poison or just shooting him? Why risk smuggling radioactive material into the UK which is an act of war? Yet that is exactly what the UK/US media would have you believe. They want to say that Putin had someone sneak into the UK with polonium and poison Litvinenko with it. It just isn’t plausible. It’s actually absurd. Alexander Litvinenko who was formerly FSB fled to the UK to avoid court prosecution in Russia, worked for a shady Russian oligarch, Boris Berezovsky. 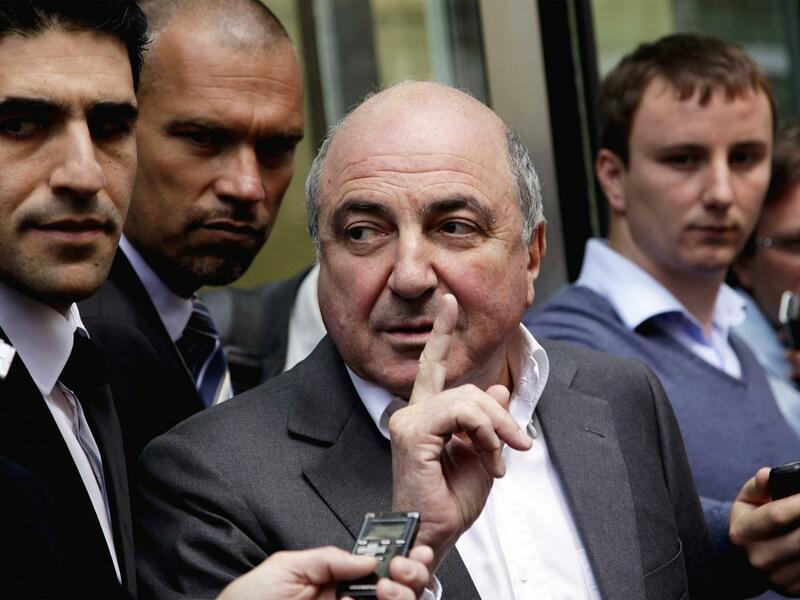 Boris Berezovsky just so happens to be the Israeli-Russian oligarch who lived in London after fleeing the Russian judicial system for a multitude of crimes too long to list. He was on Interpol’s most wanted list. Here is the grand prize. After the US and UK press branded Putin with the poisoning despite there being Zero evidence, (something the US is very well known for now) investigators were tracking down the traces of Polonium in the UK. They detected traces of Polonium at Berezovsky’s office and residence! Now I do not know about you, but in my place of work, and certainly in my house, I do not have rare radioactive substances. Polonium is not something you just get at the market or pick up by accident walking through the park. No experienced mob boss like Berezovsky would be dumb enough to murder an underling in such a manner either. Therefore his death was an accident. It was mostly likely it was a botched smuggling operation. Why was he moving such a dangerous substance? Did he need fast cash? Were they planning to create a dirty bomb? Such a “smoky bomb” would turn the Polonium into powder and kill anyone who ingested it. Traces of Polonium were found on the planes that Litvinenko had been on. So I think we can deduce what happened. He was a mule. The questions remain, why did he have it?, Where did he get it? What was he going to do with it? Why was it in the offices of Berezovsky and Erinsys Ltd (Britain’s Blackwater)? The “Putin did it” smear case has never made sense. First of all, the amount of polonium 210 in play would have cost millions of dollars. That amount is too expensive to purchase and too large to go unnoticed if it were stolen. The only way to obtain such a quantity would be on a well organized black market that had a connection to a nuclear facility. It would certainly help organized crime if the nuclear powered supplier they received the Polonium from was not subjected to international inspections or part of the nuclear nonproliferation treaty. Such a country, (Foreign country A) which denied they even built nuclear weapons for decades, would certainly also deny selling their Polonium byproduct as well. Is it possible to hide that from the press? Yes. The media would ignore this for the same reason the media ignores them stealing nuclear secrets and building hundreds of nuclear weapons in Dimona, then throwing whistle blowers who took pictures of their warheads, in jail. Litvinenko was in Israel, where he met Leonid Nevzlin the CEO of Yukos shortly before he died. If you wanted to buy/steal radioactive material that would be the place. What was he negotiating with Nevzlin? We learned Alexander had been an informant in a case that led to the arrest of nine Georgina and Russian Mobsters in Spain, including Alexander Gofstein a lawyer for Yukos who apparently was laundering money. The downfall began when Georgina Mob Boss Zakhar Kalashov was arrested in May 2006. The scam was similar to what the old Five Families of New York had done, when guys like Meyer Lansky took profits from illegal gambling businesses and funneled them into buying up real estate in Florida. In the European case, the mob was taking illegal funds and buying up real estate in Spain as well as making investments into legitimate businesses. Litivnenko’s associates, Dmitry Kovtun and Andrei Lugovoi, who both had met with him the day of the poisoning, were also both hospitalized. They left traces of Polonium in Hamburg as they had taken the trip to Germany before meeting Litvinenko. It appears all three were involved in a smuggling operation, but for who? Short answer: Russian Oligarch Boris Berezovsky’s employee Alexander Litvinenko died from over exposure to Polonium in a botched smuggling operation. That is why traces of it were at Boris’s house and on the planes Litvinenko was riding to and from Israel. The smear on Putin/Russia using a highly traceable 10 million dollar poison to kill a critic is about as plausible and rational as saying we have “British Intelligence” about Niger…. This transparent bogus lie was a quick and shamelessly sloppy explanation to cover up how and why this man in the UK had a radioactive poison in his body. Polonium only has a half life of 138 days. Litvinenko had been in Israel to visit Yukos’s CEO, just shortly before he died. And it’s an open secret that Israel has nuclear weapons, the only place without nuclear safeguard or inspections. Traces of polonium were also on the British Airway planes that Litvinenko took to and from Israel. So it they would have the means, location, and the timing fits, but let’s just blame, Putin “The New Hitler” as Neocons have dubbed him? Why the fuss about a conspiracy claiming that Putin put Litvinenko on a hitlist and poisoned him? Well as wacky as that story is, it was probably the best they could come up with on short notice. Boris knew once the police found out how Litvinenko died that there would be a lot of explaining to do. He also knew that if the investigation went forward that they could find more of this Polonium on his properties. So they just claimed the KGB was trying to kill them all. This is not the first time that Berezovsky tried to pin a murder on someone else and claim that all the damning evidence pointing to him was a frame. There are the notorious cases (in Russia) of Ivan Litskevich and Vlad Listyev. Ivan Listkevich was the general director of the Omsk oil Refinery easily the best refinery in Russia. Abramovich and Berezovsky planned to take over the refinery and make it part of Berezovsky’s Sibnef (which it now is). Listkevich resisted. Ivan had outside investments from LUKoil (10% of the stock) and CS First Boston. So in no way was he threatened to sink. Omsk was in the best location, had the latest equipment, and was well positioned to continue to soar. They serviced the biggest oil producers in Russia. Naturally Ivan did not want to be swallowed by Sibnef. August 19, 1995 Ivan was found drowned in the Irtysh River. I doubt he went there to swim. Five days later Sibnef (Gazprom) took over. August 24th 1995, using his good buddy Yeltson, Berezovsky got a Presidential Decree №872, to order a transfer of all the state’s share in Omsk as well as 4 other companies to Sibnef. Then in 1996 Boris and Roman privatized Sibnef through a series of Loans-for-Shares’ auctions which were a complete scam run through front companies and offshore banks. Yeltsin approved of it. The case may leave doubts in the mind until one learns about the murder of Vlad Listyev. In 1994 Boris attacked one of his rivals over control of a media outlet. Part of the attack was broadcast all over TV and came to be known as “faces in the snow” as Boris’s rival’s bodyguard were forced at gun point to lie face down in the snow. Shortly after a 90mph high speed chase and attacking rival Gusinsky’s MOST guards and pinning Gusinsky in his own building, Berezovsky would take control of ORT (channel 1) through an illegal non-public “auction” and gain a near media monopoly. For details on that I recommend reading “God Father of the Kremlin” if you can still find it. It was written by the senior editor of Forbes in Russian who holds a Ph.D in Russian history Paul Klebnikov. For the record Paul Klebnikov was killed after publishing his book on the Oligarchs, particularly on Boris, who is on the cover. He was shot four times in Moscow while leaving work and then died in the hospital after getting stuck on an elevator. After the Gusinsky event, Boris had another problem. Vladislav Listyev. Listyev was probably the most popular talk show host in Russia and a TV producer. He was a business partner with Boris but the problem was he was not crooked. As general director of ORT he decided to fix a multi-million dollar leak in the company and indirect way of Boris paying people off in the Mob to do dirty work, as well as paying himself by spending money for ads in other companies owned where he also ran the advertising sales. He had an offer from Sergei Lisovsky to buy up the sector. Negotiations never went through and Vlad had a different idea. On Feb 20th 1995 Vlad announced that he would break the monopoly of Boris and Sergei. He called for a moratorium on ORT advertising until they could work out ethical standards. As you can imagine that did not make Boris or the rest of the mob happy. Eight days later Boris personally met with “Nikolai” a mafia boss, and handed him a hundred thousand dollars in cash. This was witnessed by two police officers who were monitoring the Mob. Prior to that Boris’s lacky Badri offered money to a different gangster but that man was arrested before he could do what was asked of him and he confessed this in jail. On March 1st the day after Berezovsky paid a second Mob Boss, Vlad Listyev was shot in the back at the entrance of his home. Guilty as sin, with a confession against Badri as well as being personally witnessed by two police, offering another mob boss money, Boris was desperate. He was inches away from being arrested. Boris’s TV network was cut out of government subsidies after the police raided it and it was subject to bankruptcy. Fellow Media giant and friend Ruppert Murdoch promised to invest in the network and bail him out. How nice. And we all know where Murdoch stands. This relationship might also explain why Fox News and Sky News in the UK were so blatantly cheerleading the “Putin killed Litvinenko” conspiracy story. But here is the real kicker. It is just as outrageous and far fetched as the Litvinenko poisoning. Boris concocted a story for Yeltsin which was recorded on video tape produced by Irina Lesnevskaya a producer at ORT and a friend of Yeltsin’s wife. The tape claimed that it was all a big conspiracy against Berezovsky and that the real culprit (who had no motive other than to frame Boris [apparently able to hire a gun to kill Vlad but not Boris?]) was none other than bitter rival Gusinsky of Most Bank who Boris had already tried to kill once. Yeltsin was paranoid of Gusinsky’s political ambitions and Boris knew this. Boris also blamed X-KGB and said Vlad was killed by the MOST group, and not the mob he was witnessed meeting with a week after Vlad was going to break his monopoly. (Sounds like “Iraq moved the nonexistent WMDs to Syria just to make the US look bad.” give me a break) Boris claimed to be set up because he was loyal to Yeltsin as was his new media outlet. Yeltsin ever a partner in cover ups, not to mention a drunk and a thief, got Boris out of trouble once again by firing the lead investigators in the case which intimidated others to drop it. There was a huge public outcry. A TV personality had been killed. ORT created a new company called ORT advertising with a monopoly to sell ads on commission no less, and the boss-man chosen was none other than Sergei Lisovsky. Wow how utterly shameless. If you can speak Russian or if you can find an English copy of the Boris/Lesnevskaya tape transcript sent to Yeltsin, it’s going to make you very angry. It is about as plausible as saying Putin risked an act of war with the UK to kill a critic who worked for both a criminal as well as terrorist. So we know what didn’t happen. But there still remains a “who done it.” The quickest way to get to the bottom of this is to see who is lying the most and loudest, because that is usually who has the most to hide. Remember Anna Politkovskaya? She was killed on Putin’s birthday and the alternative press and the ‘mindlessly accepting any conspiracy’ types who fell for it, tried to use that circumstantial “evidence” to blame the murder on Putin. These are the same types that claim Russia bombed its own apartment buildings to start a war with Chechnya omitting the fact that the apartment bombing took place five months after the war has already started, and the “sources” trying to blame the FSB were none other than Boris’s lacky Litvinenko and well known plagiarist David Satter, who wrote for the PNAC co-founders’ Weekly Standard, which gave the world all the bogus lies about Iraq’s WMD and connection to the September 11th attacks. Robert Kagan, the paper’s cofounder with William Kristol, wrote an op-ed in the Washington Times calling “Speaking of Iraq” which pushes every erroneous prewar scare tactic there was. His wife Victoria Nuland is the same woman who was recorded on the phone saying “F” the EU and openly talking about who would be a good replacement Prime Minister in Ukraine. She chose Arseniy Yatseniuk, who she called “Yatz” and he did become the prime minister of Ukraine a month later after the coup. Everything out of this factions mouth has been blindly anti-Russian. There is a huge difference between conspiracy and kookpiracy. Getting away from the outlandish unsubstantiated claims about Anna’s death, let’s uncover something factual. Anna Politkovskaya was the journalist who had published three different articles on how SOMEONE was testing Polonium on Chechen children. Gee! Where have we seen THAT scenario before? Anna’s articles were published in the Novaya Gazeta in 2006 and she was killed October of that same year. The prosecution cornered Dmitry Pavliutchenkov a former policeman who in turn confessed Lom-Ali Gaitukayev was who negotiated the contract killing and behind him he suspected Boris Berezovsky. Dmitry was sentenced to 11 years in jail. Five men were found guilty in her murder. Three were the Chechen brothers who had been acquitted in the first trial and they went to prison. Rustam Makhmudov and Lom-Ali Gaitukayev got life sentences in 2014. Berevsovsky had died the year before in March of 2013. The most troubling thing here is not that mob did something illegal or that the Western press jumped the gun to do a anti-Russian witch hunt. All of that is pretty run of the mill. It’s not even that Israel secretly has nukes and is involved with organized crime. Again, image my lack of shock. It’s not even the multiple murders that are most troubling. The most troubling part of this story is what the ultimate purpose of that much Polonium was for and why it was in the UK. The potential for a dirty bomb is enormous. With the current climate of ISIS and disgruntled youth in Europe joining the mercenary forces to fight Israel’s enemies in Syria and Lebanon, a dirty bomb in the UK is not an unimaginable scenario. Just having such a thing could also hold leverage over politicians there too. The source of the Polonium should have been traced and potential sources should also be subject to inspection.